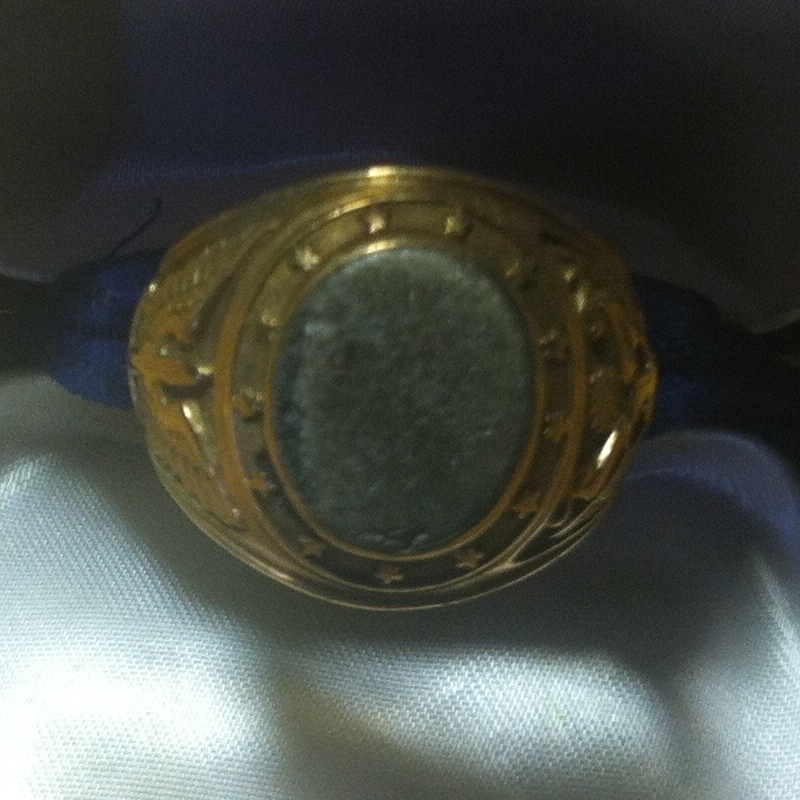 To review: The Buslee’s had finally received their son’s ring after a very long wait. A quest that had begun at the beginning of that year was finally complete. Mr. B, who had done a great service for the Buslee’s, must not have realized how much the return of their son’s ring must have meant to the them. First of all, the best wishes and regards. I just don’t know, how to start this letter and how to express our thanks and appreciation for your nice Xmas presents-!!! And I wish, too, if you just know how ashamed we are, because we did not send you the smallest present-!!! Please, dear Mr. and Mrs. Buslee, if you may, forgive us-! Once again thank you so much for me and my wife and PLEASE, Mrs. Buslee, don’t think a minute, you owe me anything-! If you would do that, I would be more ashamed, than I feel now-!!! We hope, you have had a nice Xmas-of course, we know your sorrow-and we have been talking about you plenty, last two days. When I listen to the radio, to the nice Carrols and to the nice preaching last two days, I just think, how the world would be happy, if all the peoples in all the countries would be like you or Z’s family, families who are thousands of miles away from each other, but those thousands of miles don’t stop the nice feeling for each family. I don’t know, if you will understand that I try to tell you, but the way I mean it is, that over the radio, in the churches, they tell us, to love each other, but how many peoples, how many nations, put this in reality?-! Once again, Mr. and Mrs. Buslee, PLEASE never thank me again, because, it really was nothing what I did for you, and everybody would do that-! I stop all my mail to Czechoslovakia, because I hate to make somebody unhappy. Everybody in Czechoslovakia, who is writing letters to USA, is considered as a spy and reactionary. One of my friend, who came with Dr. Beneš from England and used to be his bodyguard commander in the Hradcany castle, -he was a Colonel-is now working in mines. He send me a letter through his friend, who is in Austria, that after the Communist took over, they came to his apartment, search everything and found some mail from me, in which I wrote the truth about the new red master. And now they are after my letters and open all my letters. Besides, I am writing anti-communist articles in Czech papers in USA, and they have me marked, and I would not dare, to go and see my dear mother in Czechoslovakia. I know, I never would return-! It is a terrible life in that unhappy country under the red masters. Brother don’t trust his own brother-! It’s an awful life-! God bless our good USA and all the good peoples, because this still is one spot on the earth, where, if we wish, can say, that we don’t like Mr. Truman, or any of his cabinet members. If somebody would say so in my old country, it would mean 10 Years in mines-! Once again, we thank you so much for your nice presents, and believe me please, how ashamed I am, that I did not remember you-! Along with the ring, came the knowledge of details of the death of the Buslee’s son, John Oliver (Jay). That year, 1948, must have been nearly as painful as 1944 and 1945, when Jay’s plane went down and the Buslee’s endured waiting for word and then finally learning of his death. They could no longer hold their son, but now they could hold his ring. To review: Z’s family in Czechoslovakia sent the ring on April 8, 1948 to the Buslee’s in Park Ridge, Illinois. Expected arrival was April 29, but the ring had still not surfaced by September. In an effort to locate the ring, Mr. B had written to the American Embassy in Czechoslovakia on September 9 and had received a reply that the embassy was in possession of the ring. Your letter of 9 September 1948 has been referred to this office for reply. We are indeed happy to inform you that we now have the ring in question in our possession and that the ring will be sent to “Mr. and Mrs. John Buslee, 411 Wisner Avenue, Park Ridge, Illinois, U.S.A.” immediately by registered APO mail. To review: The ring, which should have arrived at the Buslee’s home by April 29, 1948, had vanished. This letter from Z’s mother is undated and I have no way of knowing when it was written other than it must have been written between July and September based on references in the letter. Before I go further with my letter, I am sending the best wishes to you and your family. Thanks once more for the lovely letter and the photos. Please excuse me that I have not written any sooner. We were expecting a message from you folks that you received the ring, but so far we did not hear from you. I am sending also a few pictures. Out here in the country we are not very well prepared to take pictures as good as the folks in the city. When we are altogether again we will take a family group and send it to you. We were hoping that our son would be home in June, but new developments made it impossible, and he will not be home before, if then, October. We will be very happy when the occasion comes that you folks could visit us, and also Mr. B. We would be very happy to have you in our home. We are sorry we do not speak English. My husband talks a little German, but not very much. We are thinking of you every day and every time the mailman appears we are looking for a letter from America. We were thinking we were doing the right thing and sending it the safest way, but as it turned out, it was not safe at all. We realize that you folks are anxious to get the ring, but there is nothing in our power for us to do so you can get it sooner. When my husband came back from Prague we were very happy because they promised you folks would get the ring in 21 days. Mrs. Buslee, you are asking me how many children we have. The oldest 24 and the youngest 21. [Two other sons besides Z.] Both are healthy and good boys and the oldest one has learned pastry making. The youngest one goes to electrical engineering school. I am plenty busy to get the washing, etc. ready when they are home. We also have with us my oldest sister and my husband being sick needs good food, so we are raising quite a bit of poultry on our little farm and we are enjoying the living in the country. It is very nice and all we hope for is final settlement and peace. I have written you about our family and do not want to bother you any more with a longer letter. We all are happy to get letters from you any time you find a little time. Write to us. To review: In his last letter, Z’s father reported that he had sent the ring on April 8, 1948 and that the Buslee’s should receive it within three weeks – by April 29. Almost four months later, the ring had still not arrived. While the Buslee’s were wondering what had happened to the ring, Z’s family and Mr. B were confused as to why the Buslee’s had not given them any good news and thanks for sending the ring. Please, forgive me, that I am writing to you, but I have just received a letter from Z’s father and it is a very sad letter. Well, Z’s father would like to know, if you have received the ring, which belonged to you beloved son John. Enclosed you will find a Confirmation, which Z’s father, after he gave the ring to the American Military Attaché, received from the American Embassy in Prague, dated April 8, 1948. It read, that The Office of the Military Attaché received the ring from Z’s father, to be delivered to the family of Lt. John O. Buslee. That prove, Z’s father delivered the ring to the Attaché. I wonder, Mr. and Mrs. Buslee, why didn’t you write to Z’s father, that you have the ring, so he would be sure, that his service and his trouble, was not useless-!!! I send to Z’s family two CARE packages, because I know, how happy they were, to do this service for us and because I know, it was a very expensive trip for him, going to Prague with the ring. But, all he would like to know, is, if you received the ring which belonged to you beloved son. If not, please return enclosed letter from the Military Attaché, and I will send it to Z’s father at once, so he can investigate, why the ring was not send to you. I do hope, you will understand, why I am writing to you, because I just feel sorry for Z’s family. To review: After Z recounted his experience of witnessing the crash of Lead Banana, his father wrote a letter to the Buslee’s detailing the event. Z’s father wrote again very soon with more news about the ring. Here is the translation of Z’s father’s letter, but please kindly correct all the errors in spelling-! I am informing you, that to-day, that is 4-8-1948, I have send the ring, which belonged to your son. It will be send to you by the Military Attaché of the US Embassy in Prague. I gave the ring personally to him and he thank me very nicely. Now I have only one wish, that is, you get the ring, which belonged to your beloved son. After the information from the Military Attaché, you will have the ring in 3 weeks and please, after you will receive it, let me know. I wish to tell Mr. B about this too, but I forgot his address at the office of the Attaché and will write to him soon, as I get home. Please be sure, how happy I am, that with the help of Mr. B I was able to do this for you. Well, Mr. Buslee, I am sure you will have the ring in next 2 weeks, and I too, just like Z’s father, will be very—very happy-! Yes, it is hot here in Texas, but you just get use of it, but I tell you, Mr. Buslee, if I would be in Chicago only one winter, I guess I would freeze to death-! For three years, our daughter – she try to get us to New York, but I am afraid the winter would kill me. She told me lately, “daddy, I will find a little home and Shoe Shop for sale, /I have a Shoe Shop here/ and you must move to New York-! But we still don’t like the idea-! You know, the winter here is very mild. July, August and September, well, this three months are “no good”,-too hot, but the nine months of the year, just fine-! The only trouble I have here, is my Arthritis, which tortures me for long time, and the climate is no good for this kind of trouble, because it is here very low. Next July we are planning going to Hot Springs, Ark., and I hope to cure that “so and so”-Arthritis-! If we ever will travel to New York to see our daughter, we will go via Chicago and see you, Mr. Buslee. And if you ever will travel to the South, please, do not forget Richmond-!!!! To review: On March 26, Mr. B sent a translated letter to the Buslee’s explaining that it would be possible for the finder of their son’s ring to send it to them from Czechoslovakia. In a follow-up letter, Z’s father explains that his son was home on a short visit and told of the crash of the Lead Banana on September 28, 1944. In a previous letter, Z identified the date of the crash as September 22, and in this letter as September 24. Thank you for your nice letter Mrs. Buslee and please, forgive me, it took me two days to answer your letter. First, here is the translation of Z’s father’s letter. Please kindly correct those words, they are written in “my” English, that mean, there is plenty of errors in spelling, but, I do hope, you will understand-! In addition to my first letter, I am informing you, that my son Z came home on very short visit and was unable to answer your letter and asked me, to do so for him and to tell you about the plane in which your dear son found his death. On Sept. 24, /Sunday/ about 14 hours, /That is 2 P.M./ came a swarm of bombing US planes and the direction was Magdeburg in Germany. One plane was separated from the swarm and the way it looks, damaged. Finally after a while, the plane came down in flames near the village. My son, who have been in Germany on forced labor in lager close to village, went to the scene and came there sooner before the German authorities did. The plane was burned, motor deep in the ground and the way it looks, everybody in the plane was dead and burned, too, because there was no sign of any body of the dead flyers. Because the place, where the plane came down, is out of populated places, it is not possible, that the flyers, dead or injured, have been removed, before Z and his friends came to the wreckage of the burned plane. The very next day, Sept. 25, 1944, my son and his two friends, one Czech and One Frenchman, went to the place again and in the ruins they were looking for some souvenirs. My son found the ring, and at first he thought, he found some little part of the instruments of the plane. But after cleaning the little thing from all the sticky material on it, he find out it is a ring, which must belong to one of the dead flyers. Then he found the name, the serial number and the engraved Emblem of the USA. The stone – the color of the stone – is damaged by flames and it is not possible to tell the original color of the stone. After Z came home from Germany, in Dec. 1944, he hide all the things he found in the burned plane, it was some papers and some money besides the ring, and after the liberation in 1945 he went to the Amer. Consul in Prague, /I will return to this point of Z’s father’s letter-!/where he told them all he know about the plane and asked them to find out the kins of the flyer, so he can send them the ring. They kept the half-burned papers and money, but asked Z to keep the ring till they find out the family of the flyer. With the help and kindness of Mr. B it will be possible for my son, to return the ring to you, and it will be a great honor for me, to return this memory-ring-which belonged to your heroic son. Please, forgive my son Z for not writing to you, but he is in service now, and is changing place very often. /Here Z’s father can’t say, where his son is stationed-! /I will be happy to answer all your questions and please, do not bother yourself about the expense with sending the ring-! It will be only a happiness for us to deliver to you the ring, which, we know, will be treasured by you. My son have only one wish to you and that is, if you would be so kind and send him a picture of your son, which he would be happy to have as a memory for unknown hero and which would be the only reward he is asking for; that would be the best reward for the safekeeping of the ring-! And now I have only one wish and that is, to deliver the ring to you soon as possible, because I know, how it would and will be treasured by you-! I am looking forward to your instruction and your decision how to send the ring. So that is the translation of Z’s father’s letter. And now, dear Mrs. Buslee, let me tell you, that you DO NOT bother me and please, do not mention this again-!!! You don’t know, how happy I will be, after you will send me a letter, that you have the ring-! And I do hope, it will be soon. Z’s father in his letter to me last week told me, he believes, you will have the ring in hand in the second half of April. A pray for this-!!! I made the suggestion to you and to Z’s father too, that it would be the best way to send the ring to the Amer. Consul General in Prague, but after the information, which Z’s father gave me about those things his son have to the Consul in 1945, I believe it would be the best send the ring direct to you. I told Z’s father to go to the Czech authorities and explain them what it is all about and I am sure, they would let him send it direct. I would not care, to write direct to President Beneš and I am sorry Jan Masaryk is dead-! If I would write to him, he sure would fix it up and the ring would be here in 10 days-!! The next day, Mr. B wrote a quick note to the Buslee’s with some information he forgot to include in the previous day’s letter. By translating Z’s father’s letter, I forget to tell you that the time when the plane came down, is given in CET /Central European time/ that mean, if the plane came down 14 hours /2 P.M./CET, that would be 7 A.M, CST, or 8. A.M, EST. The time of day of the mid-air collision between Lazy Daisy and Lead Banana noted on Missing Air Crew Report (MACR) 9753 was 12:11 p.m. – just after noon. I assume this would have been the time of day at the Grafton Underwood air base. I believe there is an hour time difference between Grafton Underwood, England and Magdeburg, Germany. To review: On March 11, 1948, the Buslees received a letter from Mr. B with directions for them to send a letter to the American Consul General, Prague, Czechoslovakia, requesting assistance in the return of the ring. The Buslees wrote the following letter to the American Consul General. We have received a letter from Czechoslovakia, as enclosed. The letter from Z was sent originally to Mr. B of Richmond, Texas. While these two men were not personally acquainted, it seems that through a mutual friend, Z secured the name of Mr. B. Z was so sincere in his efforts to return the ring to the next of kin that Mr. B turned to the Veterans’ Service Officer at Richmond, Texas in an effort to secure the home address of the next of kin of John O. Buslee. 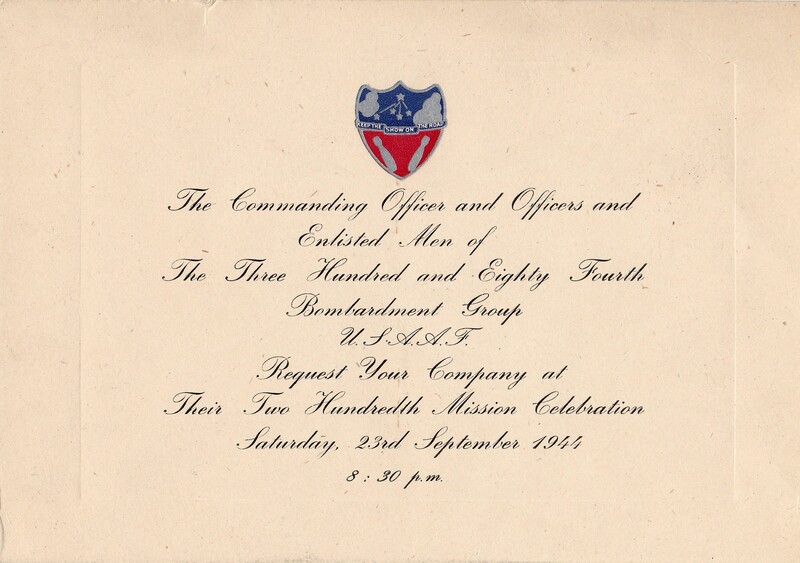 The result is that we received a letter from Col. Carle, which we enclose. This you will observe makes possible Z in Czechoslovakia learning as to the address of the parents of John O. Buslee. We are quite confident that you will appreciate the feelings of a mother and father who lost their only son, and thus far, due to the extenuating circumstances, have had little or no definite information as to what actually happened on the fatal day of September 1944. We would greatly appreciate your lending your effort and assistance to dispatch this ring to our address as below. Our feeling is that with the disturbed conditions in Czechoslovakia it might be difficult for an individual, namely Z, to dispatch a piece of jewelry to this country, and that in your position it would facilitate and make possible sending the ring to us promptly. We thank you most sincerely for your attention to this matter and assure that any effort you make will be greatly appreciated.